Bag & shoe cleaning, coloring, and restoration service ColorWash has four locations in Singapore, including one within Alexandra Retail Centre (460 Alexandra Road). Each of the ColorWash outlets provides customized cleaning, protection and restoration services and products for your belongings. For example, you can get cleaning & coloring for your bags, wallets, and shoes, as well as a high-density transparent coating treatment to make them last wear & tear better going forward. In addition, ColorWash organizes different types of workshops (with a minimum of five participants), on topics such as “Understanding Leather”, “Solving Bag and Shoe Care Problems”, “DIY” (How to care, pack and store your leather bag), and “Bag and Shoe Clinic” (where you bring your bags and shoes and learn what’s wrong with them in a highly interactive session). 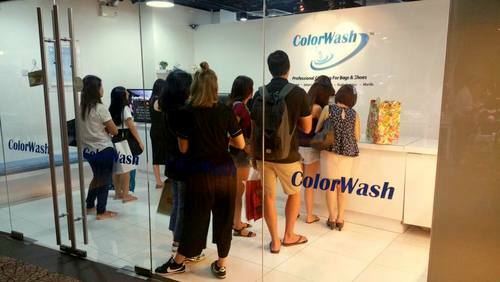 The official ColorWash Singapore Facebook page is located at www.facebook.com/ColorwashSGP/. You can also follow the official ColorWash Singapore Instagram account, which in turn is available at www.instagram.com/colorwash_singapore/.